An anti-choice Christian group recently sent a letter to congressional candidate James Woods (D-AZ) urging him to support the "sanctity of life" — life of the unborn, duh, not of women who are endangered by severe anti-abortion measures! — and his response was glorious. The anti-abortion group in question, the National Pro-Life Alliance (NPLA), is exceptionally batshit. According to the group's mission statement — which refers to abortion as "the wanton taking of human life" and fetuses as "precious unborn babies" — their goals include defining "personhood" as beginning at the moment of conception and repealing "that dreadful Roe v. Wade decision." While waiting for that big legislative change to occur, they also support laws that would force women to undergo mandatory sonograms before getting abortions. Thank you for taking the time to write to me about your anti-abortion stance. While I cannot support policies that jeopardize the health and stability of women and their families, there are many measures that I do support that are proven to quickly enhance the well-being of women — and to significantly reduce abortion. These proven pro-family, pro-woman initiatives include: promoting sexually healthy, knowledgeable and responsible communities beginning in our K-12 schools; expanding publicly supported family planning services including universally accessible birth control for all women; and strengthening government empowerment programs for low-income women and their children. 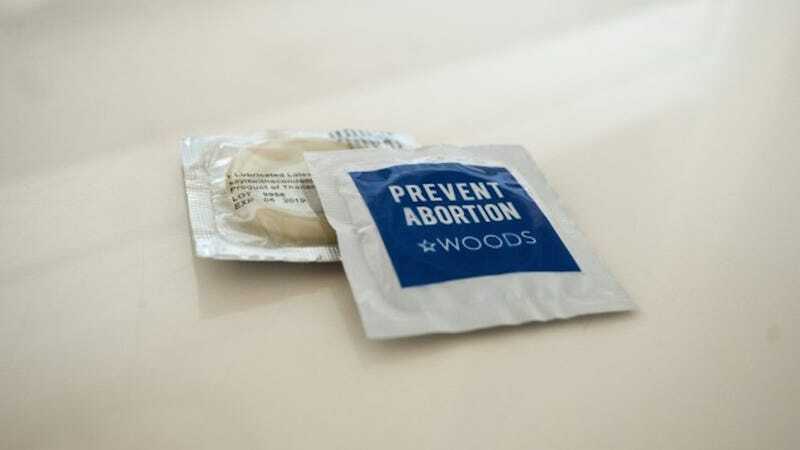 As a lovely finishing touch, he also included condoms with the phrase "PREVENT ABORTION" emblazoned on the wrapper, above his campaign logo. Perfect. Woods' suggestions are both reasonable and significant — I mean, it's pretty goddamn obvious that making contraception accessible and affordable and educating people about how to properly use it will sharply decrease the rate of unplanned, unwanted pregnancies. By extension, of course, that would case the abortion rate to fall. It seems that that's a much more proactive way of cutting down on abortion than restricting women's safe and legal access to providers (especially since highly restrictive abortion laws are not associated with lower abortion rates, just with higher rates of dangerous and illegal procedures). Of course, most conservatives are too busy squalling about how some forms of contraception are murder and gleefully defunding Planned Parenthoods — which provide several reproductive health services in addition to abortion procedures — to listen to logic. Here's hoping that James Woods wins in his district. We desperately need legislators like him.